Pumpkin pie is a rather decadent dessert, especially with all of the sugar and heavy cream, so it’s not low in calories, fat, or waistline friendly. 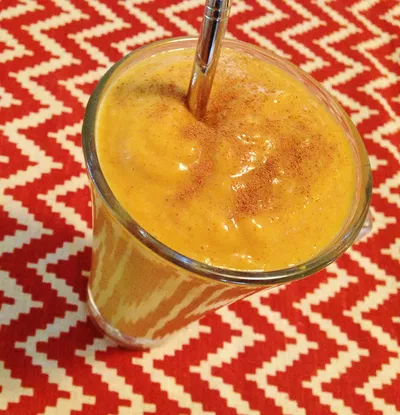 I will have a (small) slice of my mom's pumpkin pie after Thanksgiving dinner this week, but since I'd like to enjoy that pumpkin pie taste all year long, I created this lighter, healthier smoothie. I can't believe Thanksgiving is this week, but I'm ready for the feast of all feasts! I'm excited for my grandmother's buttery mashed potatoes, my aunt's sweet potato casserole (you know, the one covered in toasted mini marshmallows? ), and my mom's pumpkin pie, which is my very favorite Thanksgiving dish. Of course, pumpkin pie is a rather decadent dessert, especially with all of the sugar and heavy cream, so it’s not low in calories, fat, or waistline friendly. I will have a (small) slice of my mom's pumpkin pie after Thanksgiving dinner this week, but since I'd like to enjoy that pumpkin pie taste all year long, I created this lighter, healthier smoothie. This Pumpkin Pie Smoothie is thick, creamy, and loaded with vitamin A, potassium, and fiber. It's almost as delicious as the real thing!